Ali Affleck award winning Scottish Jazz singer and band leader. Few jazz bands can boast an award winning vocalist, but there again, few bands have such an enigmatic presence as Ali Affleck, winner of the acclaimed ‘Best Jazz Vocalist in Scotland’ award in the prestigious 2013/14 Scottish Jazz Awards, ‘Best emerging artist ‘ 2014 and Best Vocalist finalist 2017! 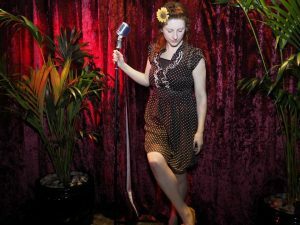 Ali Affleck leads three bands -‘The Gin Mill Genies’, ‘Bedlam Swing’ and ‘The Copper Cats’ and she frequently hosts her trademark ‘Speakeasy Sessions’ at Edinburgh’s Famous ‘The Jazz bar’ on Chambers Street. The Speakeasys are fun filled events that feature the country’s finest musicians performing together in all kinds of combinations! With constant comparisons to Billie holiday, Peggy Lee and June Christy, Ali Affleck loves to share the stage and revels in the artistry of her band. Her distinctive vocals have been described as “stunningly expressive” -San Diego Union Tribune but it is Alison’s sensitive and passionate handling of the lyrics that really stands her apart from other vocalists today … “I can think of no other young singer of Jazz who can deliver this kind of material with such authenticity and so swingingly as Alison- hence her award.”- BBC Jazzhouse, Wednesday 6th November 2013. The Gin Mill Genies, Bedlam Swing and The Copper Cats all have an energetic and lively Vintage Jazz repertoire, – a mixture of 1920s through to 1950s jazz, with many of the Great American Songbook standards in the set. Bedlam Swing repertoire is vast and covers both the well -known standards and more obscure jazz songs with sophistication and prowess. However the band’s speciality lies with rare old forgotten gems from early Billie Holiday, Peggy Lee, Fats Waller, Annette Hanshaw and Ethel waters – delightful songs that have somehow been passed over for decades. The Copper Cats perform a larger amount of traditional New Orleans Blues in their repertoire with songs associated with Bessie Smith, Mildred Bailey, Louis Armstrong, Ma Rainey, Merline Johnson, Hattie Hart and The Memphis Jug Band. Ali has been invited to perform live at the BBC twice and has also performed with the Brian Kellock Trio, The Ken Mathieson Classic Jazz Orchestra and a whole host of highly respected musicians.